Recipe for 3 cup cakes:Best eaten hot. Butter 1 tsp and some for greasing the moulds. Seive the flour and cocoa powder.Add salt,sugar,baking soda,baking powder and butter and slowly add milk to mix.Ensure sugar is dissolved and there are no lumps. 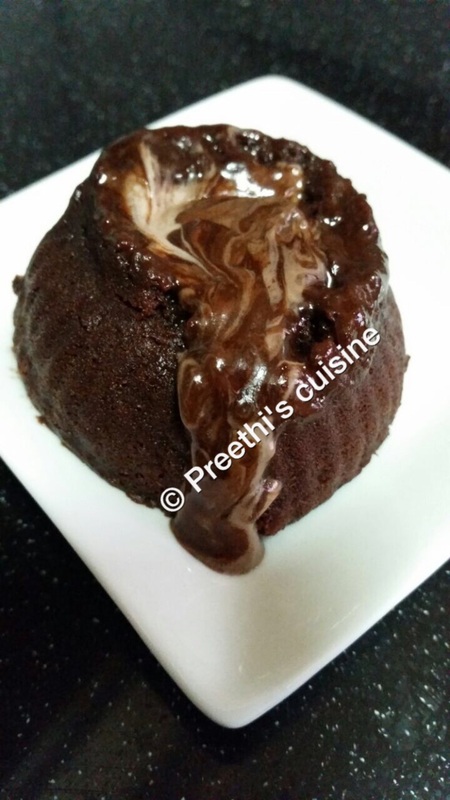 Grease the muffin moulds with butter.Add half of the mixture then drop a chocolate piece in between and cover with the mixture. Repeat the same for other 2 moulds also. Microwave at 800 for 40 seconds and your molten lava cake is ready. Thanks Rashmi. Glad you liked it.